I am all for the advancement of art history education in any way possible. The newest (and arguably most hilarious) method is this tumblr which displays famous pieces of art found in ugly, abnormal, tiny or otherwise unsuitable rooms. I honestly can't tell whether these are photoshopped (probably) or sent in by multiple people (don't think so). I'd like to offer the opinion that they are photoshopped because that means that someone put some intelligent thought into where and how these pieces might be displayed, and for any number of reasons. Shown above is an interesting one by Eric Fischl, and one of multiple works to be displayed in this tiny apartment(?) on the blog. I like this one the best because the piece speaks to its surroundings in a literal way. The walls are the same colour, the window is pretty much identical, and the banana peel on the floor looks like it just fell out of the painting itself. It's like one of those "life imitates art imitates life" type of scenarios. The painting feels slightly antique while the room feels modern, but which came first? The chicken's apartment or the framed egg? Sorry, that was a stretch. Another gem: Johannes Vermeer's The Concert. Nothing too crazy going on here, except maybe that the famous piece is shown as being kept in a storage locker (a la Storage Wars? )...although it is worthwhile to note that this painting has been missing from the Isabella Stewart Gardner Museum for 24 years and comes along with a $5 million reward for the person who returns it. Maybe the man shrouded in equal parts shadows and mystery is the culprit? 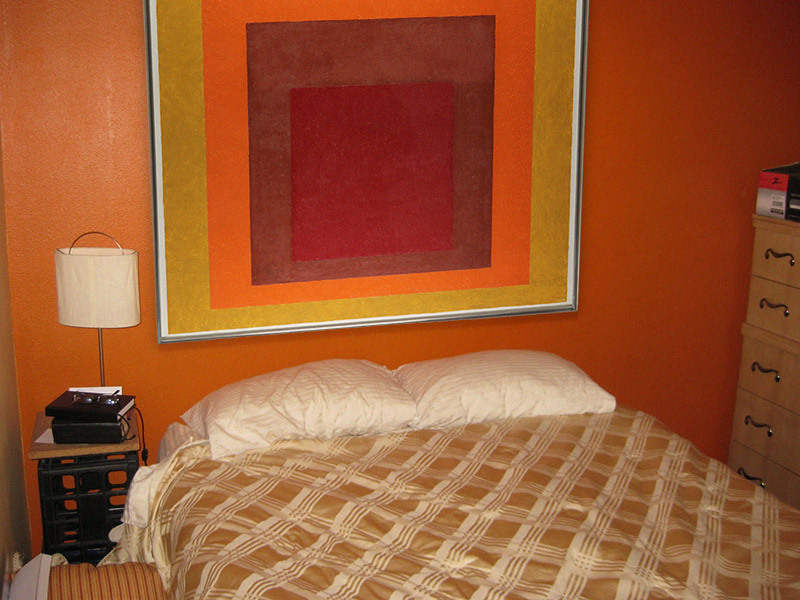 One of my favourite artists, Josef Albers. Some people might argue that his paintings, much like Mark Rothko's, are best seen from a distance of at least a couple of feet in order to gain the full experience of the piece. But indulge me as I lead you down a colourful narrative path where a young couple with little monetary means decides to invest nearly all of their savings into a piece by their favourite artist. They cannot afford anything else but a mattress on the floor and a nightstand made out of a milk crate. The snob critic would probably condemn them for not having the means to hang the piece "properly" but I thoroughly enjoy the way it is held in such high visual regard as the only item of real importance in the room. While it may be impossible to view the piece the way a critic would think proper, the piece is hung in a way that suggests it is well loved and treasured. I really like this blog because it educates, pokes fun, and asks questions in one fell swoop. Some of them are really well thought out and might even have the power to change the way we see both modern and classical art.